Mathias Point Shoal Lighthouse was built in 1876. It was a hexagonal screwpile cottage lighthouse described as resembling a wedding cake. The light had a fifth order Fresnel lens. It was located between the Port Tobacco River and Potomac River near the Virginia shoreline upriver from Dahlgren, VA. The lighthouse was constructed after a Navy steamer ran aground. 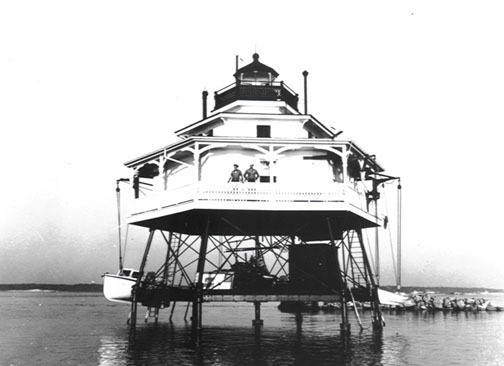 Mathias Point Shoal Light was meant to replace Upper Cedar Point Lighthouse, which was two miles upriver. Upper Cedar Point was reestablished six years later, due to continued requests from ship captains. The cottage was dismantled in 1963 and a steel tower was constructed on the original screwpile supports. The current light can be viewed from Mt. Bethel Recreation Center at Mathias Point in Virginia.